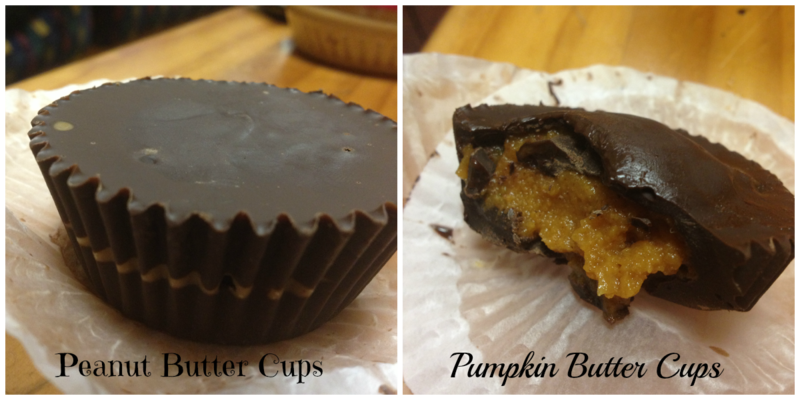 So in honor of the rescheduling of Halloween because of Sandy, I decided to make Peanut Butter cups, and since I've been on my pumpkin kick I through in some pumpkin ones, too! The recipe is super simple. I altered the original recipe it a little to make it somewhat healthier and fit the ingredients I had in my room. Combine the PB ingredients by microwaving a bit to help the PB and coconut oil mix better. I did mine for 30 seconds 2 or 3 times. ...and then top it off with more chocolate (enough so that the filling is covered). You can flatten out the top of the cup but holding the edge of the liner and shimmying it back and forth a bit. Then put it in the freezer or the fridge for a bit to cool, and there you go! They'll take less than half an hour to harden in the freezer. 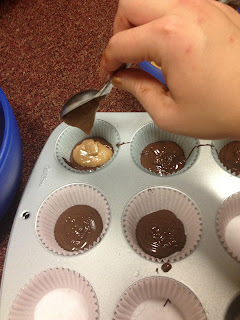 Mine were too frozen when I pulled them out, so I'm not sure how long they actually take.I decided my cups had too much chocolate to PB ratio, so you might want to make sure either your chocolate layers are fairly thin and/or you add a very large spoonful of PB. These were a hit! My friend Abdul said they were the best thing I've made all year! I responded that they're also the least healthy thing I've made all year, but hey, sometimes it's good to treat yourself! It's still a million times better for you than all the deserts at the dining hall. Peanut Butter Cups: Line 36 miniature muffin cups with paper liners. Place the peanut butter, unsalted butter, and salt in a microwaveable bowl, and heat in the microwave for about one minute or just until soft, but not melted (check and stir the ingredients every 20 seconds). Stir in the confectioners sugar. 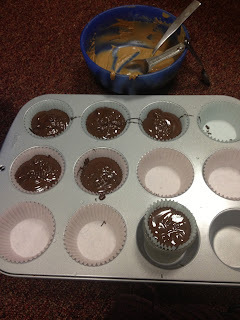 Melt the chocolates and shortening in a heatproof bowl placed over a saucepan of simmering water. Drop a teaspoon of the melted chocolate into each of the paper lined miniature muffin cups. Top with a scant teaspoon of peanut butter mixture. Then top with another teaspoon of melted chocolate. Refrigerate until set. Store in an airtight container in the refrigerator.